As we move toward the end of the season, college football becomes non-stop. Over the next few weeks, you are going to continue to see more and more games that are on non-typical college football days. This week we have a slate starting Tuesday, Wednesday, Thursday, and Saturday. 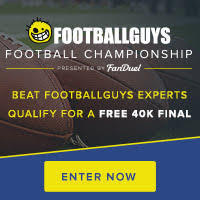 We are going to have our full slate write-ups and projections on the FanDuel landing page on Footballguys.com, but below is an abridged version of top stacks, player rankings, and value plays. 1) Matt Johnson and Roger Lewis- Outside of Corey Coleman, Roger Lewis is one of the premiere wide receivers in college football, and has the upside that very little wide receivers have. This stack is going to force you to have to go cheap at other positions, but it has the upside that no other stack has. If you are comfortable taking a chance on a few cheap players to make this work, this could win you a GPP, as these two players should both have big games against Western Michigan this week. 2) Zach Terrell and Corey Davis- Zach Terrell and Corey Davis connected for three touchdowns last week, and while we are not expecting a three touchdown game again, he has the upside to continue his streak of 7 receptions and over 100 yards. If Davis is able to do that and add a touchdown or two this stack could pay off. This will be the most popular stack on the day, so it may make sense to avoid it in a GPP, as while Davis had the big game last week, he did not score a touchdown in either of the two previous weeks. 3) Zach Terrell and Daniel Braverman- Let’s not forget about Daniel Braverman just because of two bad games in a row. Braverman is still second in overall receptions, 9th in total yardage, and 7th in touchdowns. While he has struggled over the last two games, this game is still expected to be a high scoring game, and he will be under-owned due to his recent struggles. 1) Matt Johnson- One of the elite quarterbacks in college football having thrown for 300+ yards in every game this season. He is the premiere cash game option and the only question is whether or not you are comfortable with the team that you build around him, as the price is high. While the matchup is an average one for Bowling Green it really doesn’t matter as Johnson has thrown for four or more touchdowns in four straight games. 2) Zach Terrell- While Zach Terrell had a great game, it really should have been better. Ball State was never competitive in this game, and Terrell who had over 300 yards in the first half, did not throw the ball much in the second half. This game was expected to stay within two touchdowns, so it is one of those situations where the dreaded unexpected blowout came back to hurt us. Terrell is in another great situation and this time around he is an underdog in a game that is projected to score 75 points. This is a tremendous opportunity for Terrell, as he will be forced to throw the ball a significant amount of volume to keep up with Bowling Green. Bowling Green this season has allowed 269 yards passing per game, and Terrell has the upside to easily exceed that. 3) Cooper Rush- This is the value play of the week, as going with Rush allows you to spend up elsewhere. He has thrown for over 300 yards in five of his nine games this year, and has thrown for two or more touchdowns in five straight games. With only one quarterback on FanDuel it makes it difficult to start him over Terrell or Matt Johnson due to their upside, but if you’re looking to spend up on wide receivers, Rush is a GPP option this week due to the upside if he is able to throw for 300+ yards and a few touchdowns and you're able to spend up on other players. 1) Anthone Taylor- FanDuel has not adjusted the pricing of Anthone Taylor, and he immediately becomes the top value option on this slate at $5,900. Northern Illinois is coming off of a game where they allowed 291 yards rushing against Toledo last week. Taylor has supplanted Jordan Johnson as the number one on the depth chart and had 16 carries compared to Johnson’s 14. Taylor is a must play this week in cash games, and a great value play in GPP’s. 2) Joel Bouagnon- Joel Bouagnon had his 100 yard game streak broken last week, but continued his six game touchdown streak. While he is extremely expensive this week, he is in a great matchup as Buffalo has not faced many quality running backs this year, and we expect Bouagnon to have the safest amount of volume this week. 3) Terry Swanson- $6,300 It’s hard to start a backup running back in fantasy sports, as there is a perceived risk that he is going to get less opportunities than a starter on another team. This is not the case for Terry Swanson. At $6,300, he is one of the top plays of the week, as in his six games that he has played this season he has averaged 120 yards per game with four touchdowns. The matchup is a difficult one as Central Michigan has only allowed 135 yards per game rushing, but Swanson should still see 15-18 carries which at $6,300 it doesn’t take much to make value. 4) Kareem Hunt- $8,100 Kareem Hunt is finally returning to health which is great to see him being fantasy relevant again after a tremendous 2014. The matchup is a difficult one as Central Michigan has held opponents to 135 yards per game, and he is still sharing carries with Terry Swanson, so while he has great GPP upside, he is a difficult start in cash games. 5) Jamauri Bogan- $7,700 The salary is expensive for Bogan this week, but the Freshman continues to amaze with his electric speed on a weekly basis. He has put up eight touchdowns over his last three games, including a 171 yard performance last week against Ball State. With an over/under of 75, everyone is in play in this Bowling Green Western Michigan game, but Bogan makes for a great GPP play this week. There is some risk with Bogan, as two of his last four games he has seen less than ten carries, so be careful in how you use him for cash games. 1) Corey Davis-$7,800 Corey Davis has returned to 2014 form over the last three games as he has seven receptions in each of the games and has gone over 100 yards in each of those contests. The price isn’t ideal, as there is some risk regarding whether he will find the end zone, but David makes for a great cash game play and a great pairing with Terrell this week. 2) Roger Lewis- The problem with this play isn’t the player, it’s the price. At $8,900 this severely limits your ability to fill a roster with players that you like. With that said in this high scoring game, Lewis is going to play a major role in it. Over his last five games he has had 100+ yards and at least a touchdown in every single game. He is as safe as they come, but we prefer to spend up elsewhere this week. 3) Sebastian Smith- $5,700 Ohio’s offense is not a great one as they are only averaging 18 points per game over their last three games. This hasn’t stopped Sebastian Smith who is one of the best wide receivers in the MAC conference. Smith has nine or more receptions in three of his last four games, and at $5,700 provides much needed salary relief on this slate. 4) Kenny Golladay- $6,900- Golladay becomes a must play if Tommylee Lewis is out, and it is looking like he will be unable to go in this game. In games where Lewis has been out or limited, Golladay has had his three biggest games of the year including last week where he had eight receptions for 128 yards and a touchdown. 1) Matt Weiser-$3,700 Over his last six games, Matt Weiser is averaging 6.3 receptions per game, which for a fantasy tight end is tremendous. Find a way to fit him into your cash games this week, as he is the only tight end that you can feel safe about. 2) Ben McCord- $2,900 If you have to save $800, McCord is the only other tight end on this slate worth considering. Over his last four games he is averaging three receptions per game, and he has two 100 yard games earlier this season which put him into the category of being able to consider for GPP’s. We don’t love him in cash this week, as Weiser is a much safer option, but he should be considered if you’re looking to save money or as a GPP contrarian play.